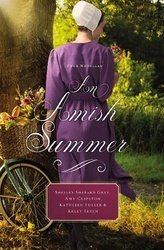 Feel the romance with these four heartfelt Amish novellas. After sisters Sharon and Sherilyn meet Graham, he accidentally becomes a pen pal with the wrong one. Can this confusion lead to something wonderful? Thanks to her meddling brother, Arianna's father is now against her marriage to Jesse and she fears the damage may be too much to repair. Esther has always lived in the shadow of her beautiful sister. But when they meet a handsome Englischer, things begin to change. Everybody can see that Jacob and Martha are meant to be together. Everyone, that is, but Martha. Will they ever meet in the middle?